Late tomorrow, there may be some relief from the deadly Camp Fire, and the hundreds-of-miles-long blanket of dense, smoky smog that’s been choking the Bay Area for well over a week. With rain forecast for Wednesday — which may help extinguish the last of the fire up north — winds are expected to shift to the south late on Tuesday. Current air quality in the Bay Area is said to be among the worst in the world, edging out cities in China and India. This photo was taken on Sunday, November 11. You can just barely see the Richmond/San Rafael Bridge in the background. On November 8, strong, dry winds raged through the Sierra Foothills, about three hours northeast of the Bay Area. Without warning, an inferno swept through the town of Paradise (where Latitude used to be printed) at a rate of 1000 yards a minute. As of today, 77 people have perished in the fire, Paradise is said to be completely leveled, and the smoke has stretched from Mt. Shasta to San Jose. Meanwhile, in Southern California, over 700 buildings have been destroyed. Here in the Bay, a few minutes outside cause the throat to burn a little and the eyes to water. Most people have taken to wearing the now-coveted N95 masks, which stores are struggling to keep in stock. 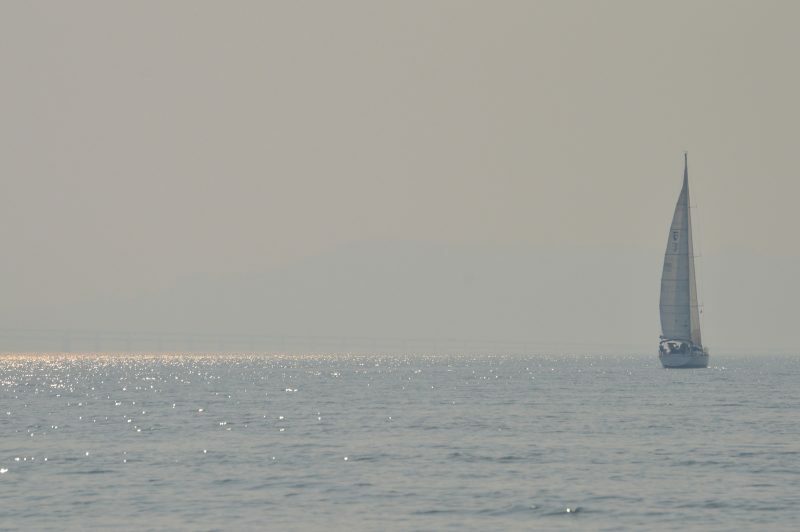 A sailboat motors through the smoky smog in San Pablo Bay — just off China Camp — on November 11. California sailors: How have you been faring through the fires and smoke? 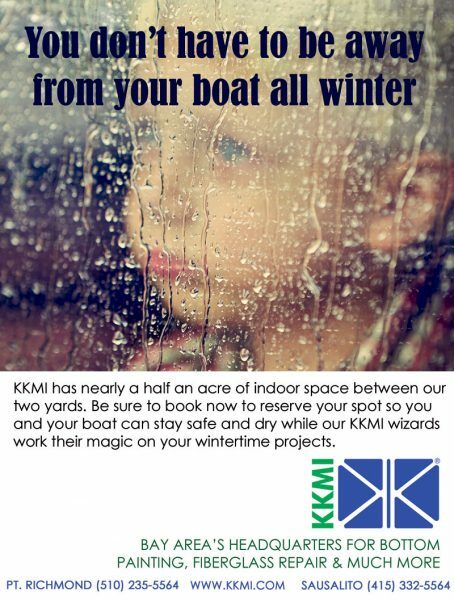 Has there been any refuge for you on the water or in your boats? We’d like to hear from you; you can either email us here, or comment on this story below. 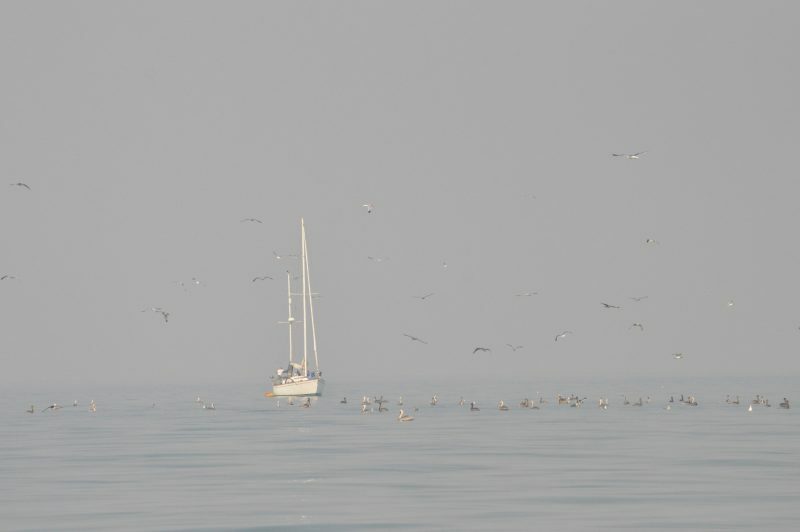 Sunday, November 11 started out still and smoky on San Pablo Bay, but the wind came up around 2 p.m. 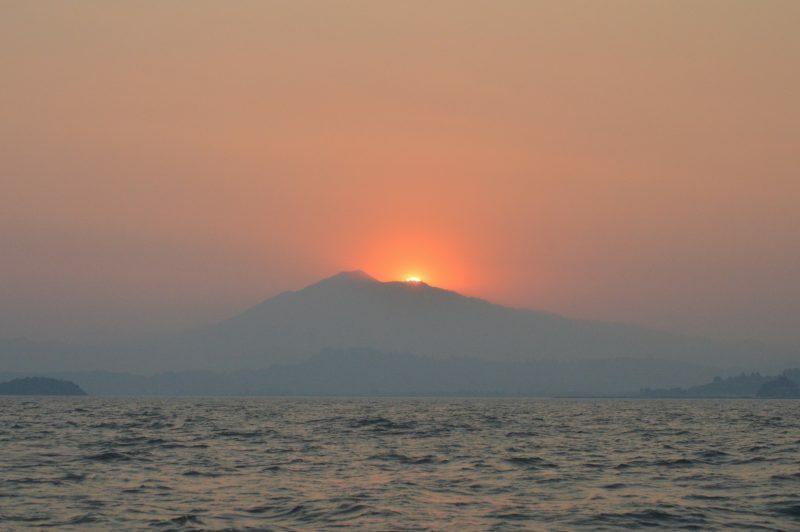 The sunset behind Mt. Tamalpais was eerie and a little sinister . . .
. . . But it was nice to get out on the water and into the breeze for a few hours. We’re sending our best to all those affected by these terrible fires. 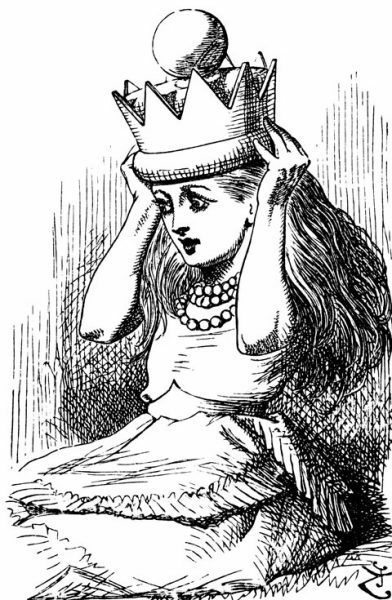 No, not that Queen Alice. 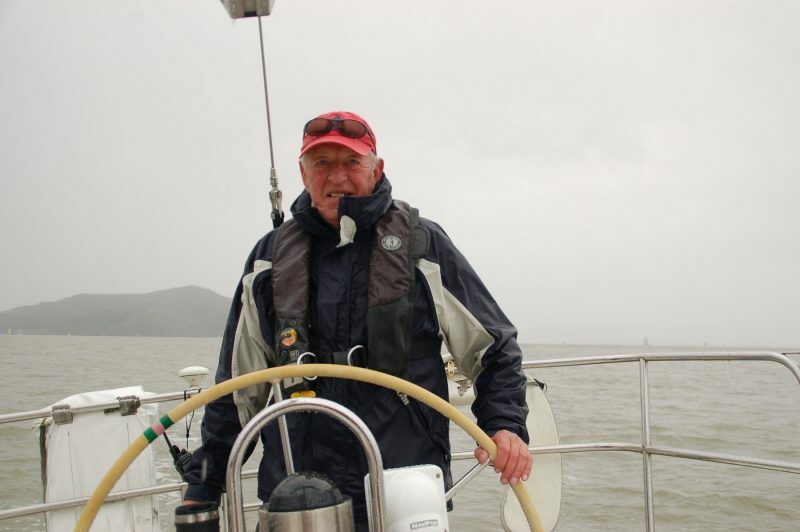 The Yacht Racing Association of San Francisco Bay held their annual awards party at Berkeley Yacht Club yesterday afternoon. The switch from the Tuesday night before Thanksgiving to a Sunday afternoon was hugely successful. Celebrants packed BYC’s dining room and lounge. The first award on the agenda was particularly special to us, as it was Latitude 38’s own Queen of the Women’s Circuit. The crew and family of the Laser 28 Sonata managed to keep it a surprise from skipper Alice Shinn, the new Queen. Left to right: Sonata crew Susan Simpkin, Alice Shinn, Alessandra Nociaro and Susan Sanders at the YRA awards party. Alice’s crew Susan Simpkins and Susan Sanders nominated her for the award. It’s based on a collection of women’s events published in the Northern California Sailing Calendar and YRA Master Schedule. Among the long list of races Alice sailed in this year were four from the Women’s Circuit: Sausalito YC’s Women Skippers Regatta on August 25, SFYC’s Auxiliary Cup on September 22, Tiburon YC’s Joan Storer Regatta on October 13 and Richmond YC’s Amazing Grace Cheney Cup on November 4. 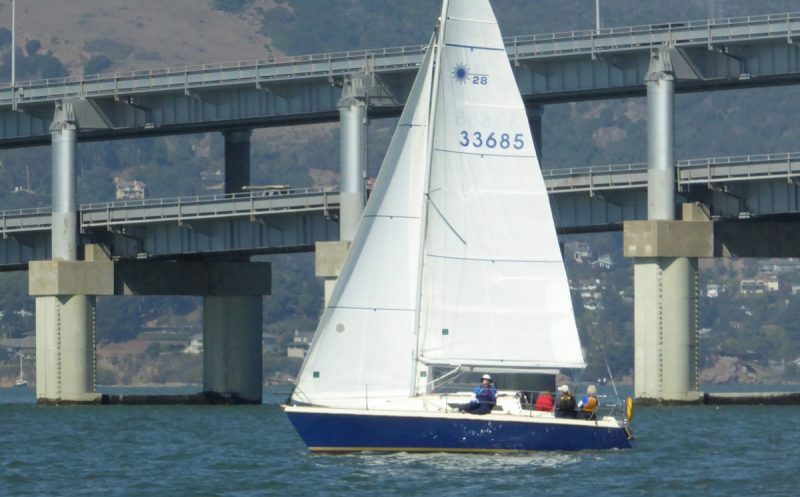 The beautiful Sonata, having just sailed under the Richmond-San Rafael Bridge in TYC’s Joan Storer Regatta. 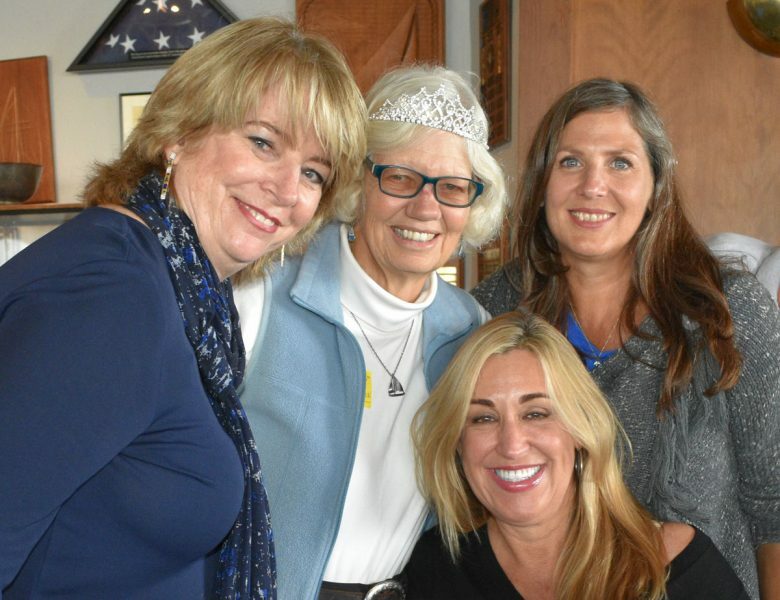 In their nomination letter, the Susans wrote: “Alice has done a tremendous amount over the years to broaden access to sailing through teaching and leadership positions at yacht clubs. Alice is generous with her time and extensive sailing knowledge. She has taken on crew who didn’t know port from starboard and turned them into sailors. In order to broaden the participation of women in sailing and racing, Alice has led by example. “For the 2018 season she cultivated an all-women crew for almost all of the races. Alice generously shared the helm, permitting seasoned women sailors who crew for her, but don’t own a boat, to have an opportunity to drive Sonata. She encouraged us to try out new positions so that we can become well-rounded crew and get exposure to experiences we might not have had with other skippers. 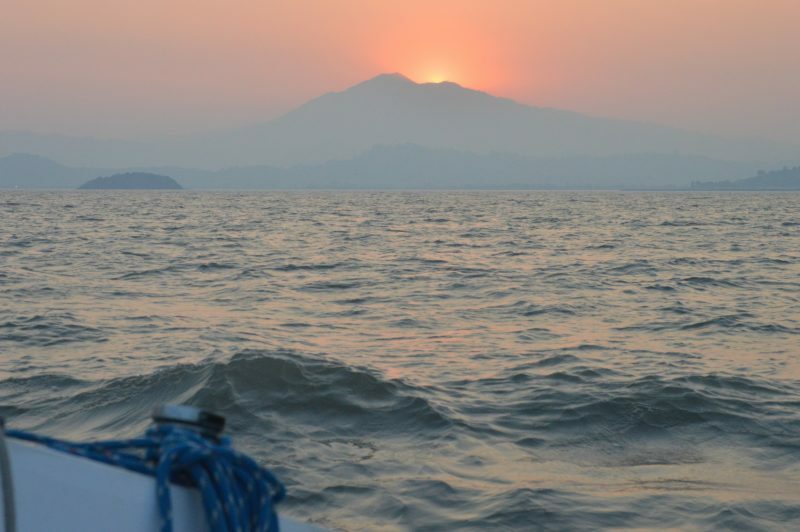 We also encourage women to race and to take the helm, and we encourage male boat owners to give them the opportunity. We’ll be publishing another ‘Unofficial Women’s Circuit’ in the 2019 edition of the YRA Calendar, coming out on December 28. We’ve been praying for rain, and it looks like we’re finally going to get it. Fingers crossed. The forecast calls for rain on Wednesday and ‘Black Friday’ — the day REI has designated as a day to #optoutside and that we’ve transmogrified to #optsailing. As REI states, “We’re closing our doors again because some things are more important than selling stuff.” And after almost two weeks hiding from the thick, acrid smoke, aren’t you just craving the outdoors more than ever? Black Friday looks like it will be a good day to rinse the smoke residue off your rigging, sails and foul weather gear after the ‘pre-wash’ on Wednesday. Since we can now all shop 24/7, it’s important to use our rare days off and this season’s limited daylight for much more rewarding and restorative activities — like sailing. Yes, you can also sail 24/7, but, unless you’re heading offshore, that’s a bit more complicated. Drizzly midwinters will be a welcome relief. 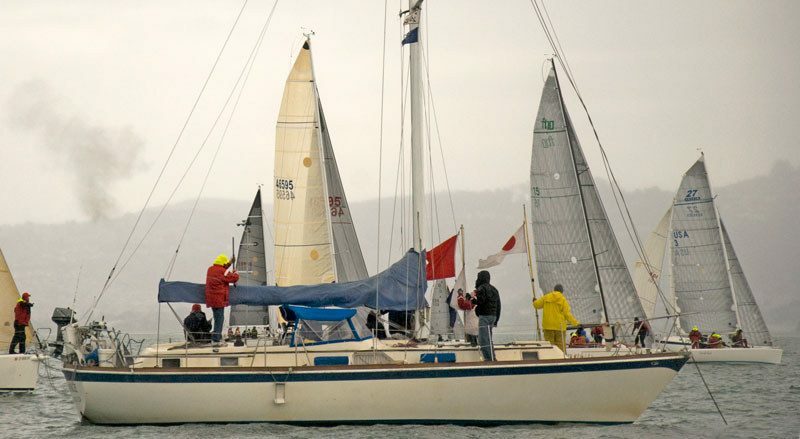 For obvious reasons Thanksgiving weekend is always light on races, though there are a few events, including Tiburon Yacht Club’s Wild Turkey Race on Black Friday and Berkeley Yacht Club’s Sunday Chowder Series. We applaud REI for remembering what’s important and inspiring us to #optoutside and, even better, #optsailing.